Sundial recently spoke with attorney Tim Cerio, the former general counsel to Governor Rick Scott, and a member of this year's Constitution Revision Commission, or CRC. That's a group that meets once every 20 years to propose amendments to outdated laws. He explained why bundled items were necessary and answered critics to Marcy's Law, the amendment he says means the most to him. But we started by asking about the whole process of creating amendments to put on the ballot. "It was great to get around the state [to] hear from the people of Florida. We have a very well-informed and engaged population here in Florida and a very vocal one. And I think we heard from divergent interests, a lot of input a lot of ideas," he said. "I think we had over a thousand proposals that were submitted. I think almost every proposal that came forward was read." 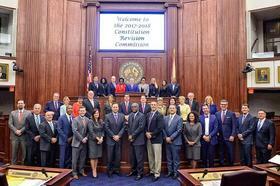 Tim Cerio was a member of the 2017-18 Constitution Revision Commission. He joined Sundial to discuss bundling proposals into a few amendments. WLRN: Were there any concerns about the fact that there is going to be a lot on the ballot? Cerio: Yeah, I mean the ballot is going to take some time to go through. And part of the issue that we struggle with, and that the CRC 20 years ago struggled with, and the CRC 40 years ago struggled with, is how do we present these issues to the voters? The reason (for bundling) was if you can take concepts that are arguably similar and combine them it will promote ballot brevity to the extent we can prevent voter fatigue. So that's why we did what we did. I know there's been a lot of interest in that and I'll be honest, there's a little bit of misinformation out there about the bundling, and that's why I really appreciate the opportunity to be here and talk about it. You try to figure out how to bundle different amendments together that are similar. Let's look at one that probably got the most attention, which was Amendment 9 -- banning e-cigarettes indoors and ending offshore oil drilling. How are they similar? I don't want to sound flippant about this but the easy answer is -- it's clean air, clean water. People care about being in a smoke-free environment. People want clean water. The truth of the matter is we really wrestled with that and again we were trying to promote a shorter ballot. And these were both wildly popular initiatives. We got third party information that these two items polled through the roof. So generally our approach to bundling was that we don't want to be accused of trying to combine something that's clearly unpopular or something that barely passed the CRC with something very popular. You talked about some misinformation out there on bundling. What was that misinformation? There's a narrative out there that several media outlets have gotten some bad information and have written that the CRC in essence sort of pulled a fast one or they're bundling and they're doing something that they should not have done. A lot of what we did at the CRC was to hopefully promote ballot brevity, at least to some extent, and prevent voter fatigue, so we bundled 22 proposals into what are now eight proposed amendments. I think that the voters are smart. They'll read through these proposals, they'll vote them up or down. If they don't like how something was combined that's fine. If they think a concept doesn't belong in the Constitution that's fine. I just hope people don't vote no because they've heard that the process was somehow inappropriate. I want to talk about Marcy's Law. The other proposal bundled in that raises the retirement age of judges from 70 to 75. Explain to us why you think these two should be put together. Marcy's Law obviously impacts how the administration of justice and victim's participation in the justice system. We need to ensure that they have access and where appropriate an opportunity to be heard and always an opportunity to be informed of their case. The idea is again to try and promote some ballot brevity. How can we combine like concepts, and Amendment 6 had to do with the judiciary. The judges are in charge of enforcing the requisites of Marcy's Law making sure that these victims have access, that their family members have access, and that's why to us at the time it made sense to combine it with the retirement ages of judges and then also the judge's role in evaluating evidence. There's opposition to Marcy's Law and one is Broward Public Defender Howard Finkelstein. He said, "The purpose of criminal justice is to determine the guilt or the innocence of the accused and the appropriate sentence. It's not a balancing of rights between victim and defendant." Another person we spoke to was deputy director of the American Civil Liberties Union of Florida, Melba Pearson. Here's what she had to say: "The Florida Constitution as it stands right now has a very robust Victims Rights section. Victims have the right to be heard. They have the right to be present in all stages of the proceedings, whether it be the filing of charges, arraignment trial, every aspect of trial, as well as sentencing. They have the right to be informed on what is happening with the case. So this constitutional amendment does not change anything from that perspective. But what it does [is] give corporations the same footing as human victims." There are two points here. Both Finkelstein and Pearson are saying that we already have enough on the books in Florida law. What's your take on that? That's not correct. And to call the process that we have now robust is just factually inaccurate. When we went around the state of Florida we heard from victim after victim and victim's families that they are not getting the opportunity to be heard, they are not getting notice of these hearings. I will say this, Miss Pearson is correct in the sense that ... our state has the statutes and they are consistently not enforced. That is why we have 10 state attorneys, one of whom is Katherine Fernandez Rundle, who have endorsed Marcy's Law. I'm not blaming the judges or the prosecutors or the defense attorneys but the system is failing because it's just an overwhelmed system right now. It's a game changer that is that is not what's happening now. And what about the second point that Miss Pearson brings up, that now this can help protect corporations? My in-laws owned an independent pharmacy in Sarasota. They were robbed at least a dozen times in 20 years. And if Marcy's Law did not allow ... these entities that are incorporated to be treated as victims they would have no ability to participate or to be informed. There were challenges to some of these bundled amendments. What if the Florida Supreme Court decides to take that off before early voting? Well, it will be very difficult. My prediction is that the Supreme Court will uphold what is still on the ballot. But it would absolutely throw a monkey wrench into things if a proposal is removed. Then the votes for it or against it will be nullified.